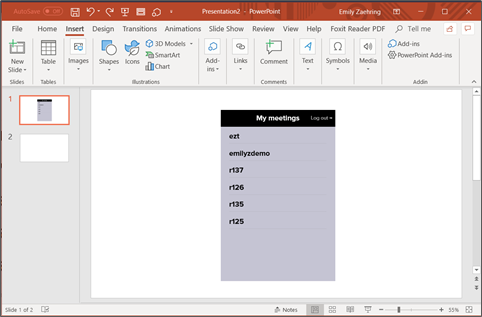 Get the MeetingPulse add-in from the Microsoft store. You can also access the store in PowerPoint through the Get Add-ins button, under "Insert". Search for MeetingPulse and then click Add. Load it according to these instructions. 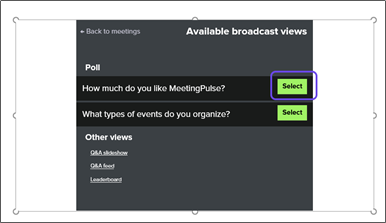 You will also need to create a meeting in MeetingPulse with the modules and polls you’ll want to use. Don’t worry about forgetting anything here; you’ll be able to make changes to the meeting after adding it to your presentation. Create a new presentation or add a new slide to your existing presentation. You’ll want to find the Add-ins section of the Insert ribbon. Click on My Add-ins to open the Office Add-ins dialog. Under My Add-ins, find MeetingPulse and click Add. 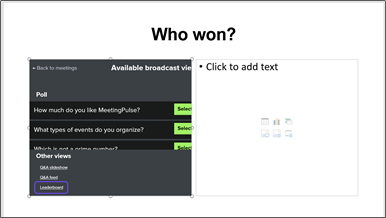 This will add the interface to MeetingPulse in your slide. 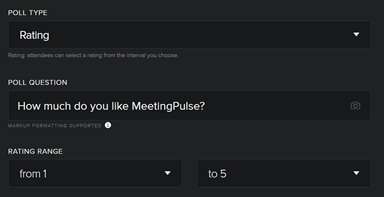 You’ll be prompted to sign into your MeetingPulse account the first time you load the add-in. 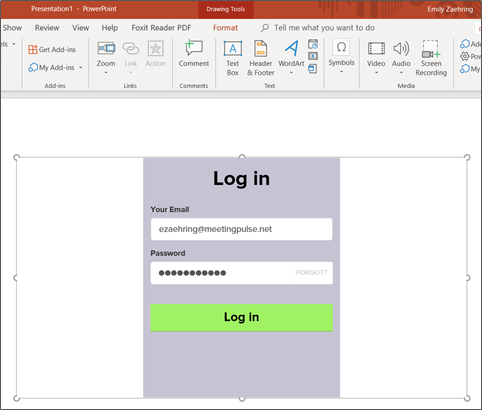 PowerPoint will remember your login so you don’t have to sign in again for each slide. Once you’re logged in, you’ll see a list of meetings that are eligible for inserting. Click on the meeting you’ll be using in this presentation. From here, you can select what you want to show on this slide. Let’s start with the Q&A feed. 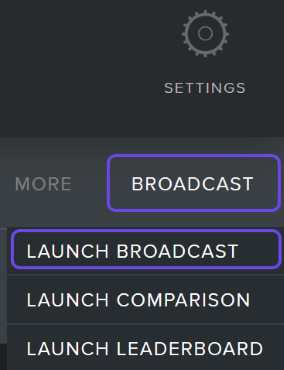 Click on the Q&A feed and add-in will load the live feed view. This will update in real-time as your audience submits questions. The feed view of Q&A is best option for a hands-off presentation. Questions are added in real-time and the most upvoted questions go to the top. 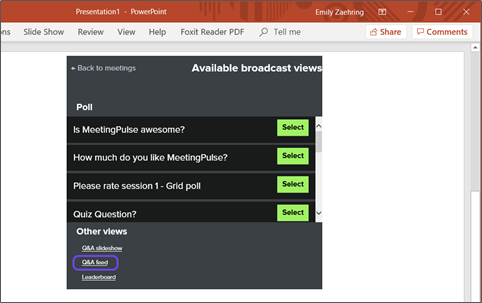 Log into MeetingPulse (app.meet.ps) and open the meeting you want to embed. 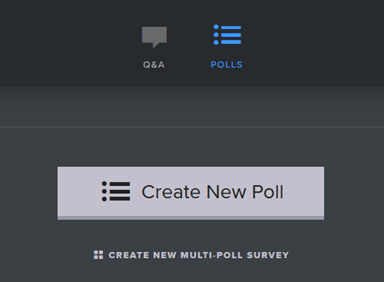 Open Polls and click Create a Poll. You can add as many polls as you like, but let’s start with just one for right now. 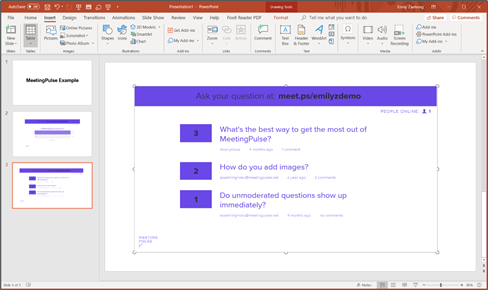 Now click Start Meeting to make it available to PowerPoint. 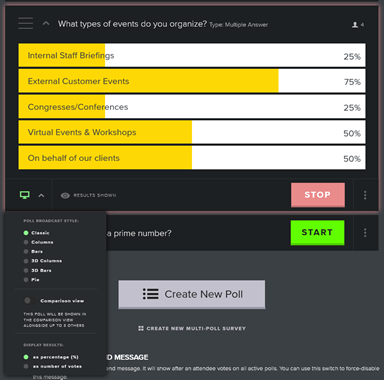 Create the slide you want to use to display this poll (it can just be blank.) Next, click on My Addins and select MeetingPulse. If you’ve used the add-in before, you’ll be logged in. Otherwise enter your username and password. Now you’ll see the broadcast view of that poll on this slide. 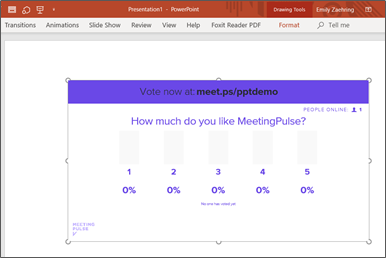 The MeetingPulse add-in will let you automatically run the polls from within PowerPoint. 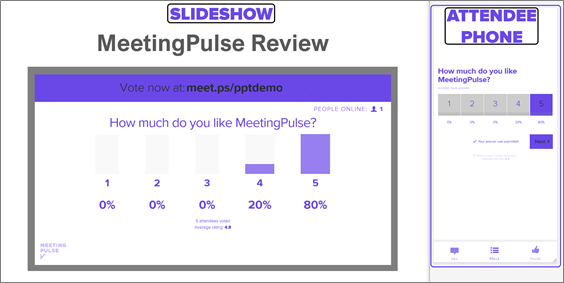 As soon as the slideshow gets to that poll’s slide, MeetingPulse will launch the poll and send it to attendee’s devices. The poll display will be updated in real time. When you go to the next slide, the poll will close automatically. You can create a quiz through our multiple-choice poll types. We recommend hiding the correct answers by default. 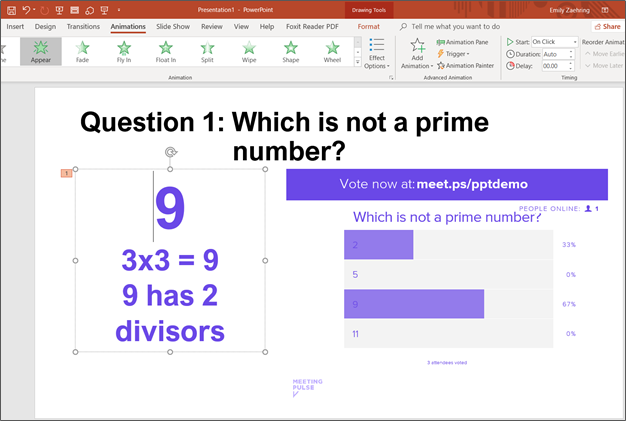 That way the correct answer won’t be shown immediately when you use a slide to run the poll. There are a few ways to reveal the correct answer. The simplest thing to do is to simply announce the correct answer. However, showing it is often worth taking a few steps to make it work. 1. You can add an animated text box with the correct answer. This will be revealed next to the graph of the quiz. Create or select the text box that has the answer in it. Go to the Animations tab and select “appear”. Now when you do the slide show, you’ll have the MeetingPulse poll on the right to start. When you’re ready to reveal the answer, advance to the next slide and the answer will be revealed. 2. Alternatively, you can use the “Reveal Correct” option in MeetingPulse and a second device. Tap on the text of the poll to expand it so you can see all the options. If you enable Prompt for Name (or use attendee codes), you can share the leaderboard of the top contestants. 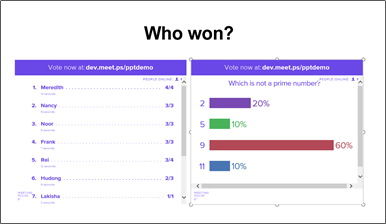 The leaderboard is updated in real-time, so it can be a fun thing to show while launching quiz polls. You can add more than one view to a slide. Simply add the MeetingPulse add-in a second time. Here, I add the Leaderboard first on the left side. Next, I click on the box on the right and click “My Add-ins” to add MeetingPulse. 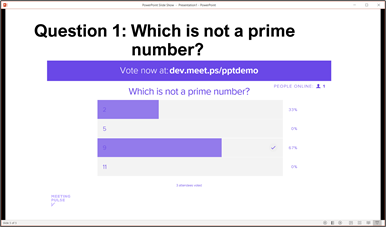 You can also change which poll is shown in a slide. To do so, click in the center of the poll graph and type Backspace. This will bring you back to the list of polls and broadcast views. You can now select from the recently used add-ins instead of having to open the add-in browser. For even easier access, you can choose to “Add to the Quick Access Toolbar”, by right-clicking on the My Add-ins button.